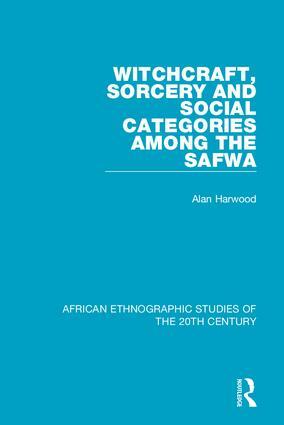 Originally published in 1970, this book explores the role of concepts of disease in the social life of the Safwa of Tanzania, particularly through beliefs concerning witchcraft and sorcery. Examining Safwa ideas about the cuasation of disease and death and the use of aetiological terms in actual cases, it demonstrates a parallel between these ideas and terms, on the one hand and the Safwa system of social categories on the other. A descrption of the Safwa environment, way of life and social system is followed by an account of the concepts of death and disease and of their causes as revealed in ancestor rites, divination and autopsy. An analysis of case histories demonstrates that the cause assigned to a particular instance of illness or death depends upon the status relationship between discputing parties who are associated with the patient. The way in which the parallel between aetiological and social categoeis helps to control the outcome of disputes is also examined.